Tecan has re-shaped automation with Fluent, an exceptional instrumentation concept built around the application-specific needs of your laboratory. Are you working in a regulated environment? Discover Fluent® Gx - Tecan's new solution for regulated labs. Fluent breaks new ground, delivering high capacity and outstanding speed. The platform provides excellent precision, throughput and walkaway time—making it easy to get more done, more confidently. Fluent was designed to meet the needs of various life science workflows, such as high throughput genomics, by combining high precision liquid handling - down to 200 nl - with straightforward set-up of normalization, sample transfer and reagent distribution using Smart Commands. 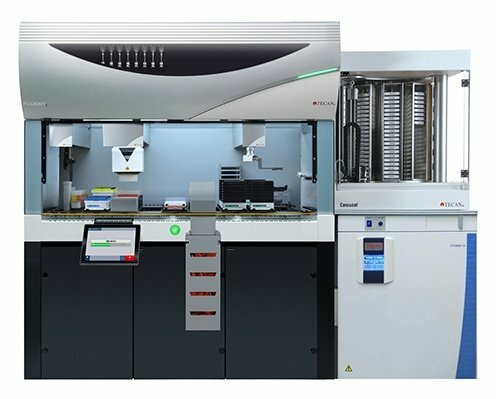 Its freely configurable architecture allows rapid integration of devices for DNA quantification and processing, and offers exceptional storage capacity for plates and tips. Fluent is designed to increase throughput and productivity, fitting more functionality into less space. It offers exceptional on-deck capacity, with easy device integration to maximize the length of unattended runs. Smoothly and quickly delivers labware—including plates and tubes—to the instrument’s pipetting arms and integrated devices without interrupting the pipetting process. Fluent's unique Finger Exchange System option automatically exchanges between tubes or plates and vertical or excentric plate handling. This extends the range of labware and devices that can be handled by the robotic arm within a single process, enabling tasks to be automated. With its exceptional deck capacity and below deck arm access, Fluent can accommodate 6 microplates or tip boxes in the depth, single or stacked, and multiple devices without expanding its footprint. Enjoy true walkaway operation with large batch capacity and the seamless integration of complementary peripherals all fully managed by FluentControl™. Three independent, task-specific arms move in parallel to simultaneously and efficiently automate methods. Sample preparation, labware movement to peripheral devices and plate to plate or reagent additions can all occur in parallel — maximizing workflow performance. Fluent’s extensive deck capacity minimizes plate transfers and reduces the time cells are outside of the incubator. Below-deck arm access offers expanded functionality and device integration without extending the instrument footprint. Tecan offers a broad portfolio of high quality consumables — from disposable tips to troughs — in Tecan Standard, Tecan Pure and Tecan Sterile purity levels. Every product undergoes stringent testing to ensure reliable automation. Connect your lab automation today and get your Introspect™ dashboards with real data on instrument uptime, consumables consumption and run success rates. Combining intuitive operation with the flexibility to deal with the day-to-day challenges faced by life science laboratories, Fluent fits seamlessly into your workflows, guiding the operator through protocol and worktable set-up. Built-in touchscreen interface guides users through daily tasks for fast, consistent operation. Method Recovery functions allow process runs to be reinstated even following events such as power out or computer crash. FluentControl™ software simplifies even extremely challenging applications. Use drag and drop interfaces, 3D graphics, and single Smart Commands to distribute reagents or transfer samples. Fluent’s Active Stop and Resume function enables the operator to instantly access the workdeck during a run—allowing set-up errors or omissions to be corrected—simply by opening the door. The Application Toolkit provides a collection of commands allowing programmers to create ‘wizardlike’ interfaces to further simplify everyday operation of the workstation. Eases development of new assays and enables you to visualize a program, test new assays without using reagents or consumables, and estimate timing accurately and precisely. "Automation frees us to focus on the areas where we add most value – analyzing data and designing experiments to answer specific project questions." Read more in "A flexible lab for the future"
Fluent offers exceptional liquid handling performance, with the option of either air- or liquid-displacement to match the requirements of your application. By offering a choice of both air- and liquid-displacement pipetting technologies, the Flexible Channel Arm provides outstanding flexibility to suit the needs of your laboratory workflow. Increase productivity even further with Dual Flexible Channel Arms using both pipetting technologies on 16 separate pipetting channels.FluentControl offers robust default liquid definitions and makes it easy to change parameters for any fluid. Fluent’s unique teach-free hardware and Path Finder™ move optimization technology deliver excellent positional accuracy and precision for enhanced process security and peace-of-mind. Adaptive Signal Technology™, a new generation of liquid level sensing, enables use of smaller sample volumes, minimizes the risk of errors and provides exceptional automated error handling. The Fluent Multiple Channel Arm has 384 pipetting channels that can change on-the-fly between 384 and 96 well formats, each of which offer combinations of row, column and quadrant tip handling formats. The format changes by exchanging the head adapter which occurs within a few seconds, extending the flexibility of plate format usage within or between each assay workflow. The adapters occupy a small space on the worktable, and can be re-docked with existing tips still mounted for applications where repeat use of the tips at a later time point is required. The Fluent offers the possibility to use the power of 16 pipetting channels – 8 channels on each of 2 Flexible Channel Arms give access to a massive volume range and choice to use fixed and disposable pipetting tips. Each channel detects and pipettes liquids individually. Both arms can work in parallel offering outstanding liquid handling performance and speed. Built-in SOPs, advanced in-process monitoring, labware identification and multi-level operator security ensure that each and every run on the Fluent is performed exactly the same, ensuring consistent, high quality results. Fluent ID™ enables simple and safe, high capacity sample identification and tracking. This scalable and up-gradable tube identification module accommodates 192 to 768 sample tubes per batch, The efficient, user-centric load-and-go operation and support of limitless batch reloading ensures complete confidence and high productivity. "We were immediately able to achieve very low CVs for 1μl plasma transfers into dry 384- well plates." Read more in "Flexibility for speed"
Fluent’s freely configurable workdeck and straightforward device integration futureproof your investment – ensuring that the system won’t become obsolete as your laboratory automation needs change over time. The fast Robotic Gripper Arm, delivers labware to the instrument’s pipetting arms and integrated devices without interrupting the pipetting processes. Fluent's unique Finger Exchange System is a field-upgradable option that automatically exchanges gripper fingers to enable handling a wider range of labware – tubes, plates, bottles, troughs, to be transferred to an extensive range of devices, including the possibility for custom gripper fingers, which ensures that your robotic needs for the future are covered. Fluent’s patented Dynamic Deck™ allows the high capacity worktable to be freely configured and easily reconfigured. A lower deck level allows devices to be integrated into the deck space extending the vertical range even for bench top systems. FluentControl™ software simplifies even extremely challenging applications. Use drag and drop interfaces, 3D graphics, and single Smart Commands to distribute reagents or transfer samples. The open architecture allows easy accommodation of new workflow protocols as assays and projects change over time. FluentControl offers straightforward integration of third-party devices, with an ever-increasing library of drivers — including support of SiLA devices — and Zero-G one-touch teaching to simplify setup. The Flexible Channel Arm Gripper option performs simple microplate moves within the worktable area, linking pipetting sequences together to enhance walk away time. The gripper fingers can be picked up by any Flexible Channel Arm using disposable tips between pipetting steps. The option can be added as upgrade to extend the capabilities of instruments with Flexible Channel Arm only. Ideally suited to genomic extraction protocols, a plate can be moved from the pipetting position to a plate magnet or shaker* this simple and clever device leverages the exceptional deck capacity of the Fluent to enable increased walk away time for pipetting sequences. With a broad range of features specifically designed to optimize the performance of cell-based and biochemical assays, Fluent enhances throughput, streamlines workflows and delivers precise and reliable results. By simplifying the handling of precious samples and seamlessly integrating with cell biology devices, Fluent automates your complex assays for exceptional productivity and confidence. "So far we haven’t found anything it can’t do." Read more in "Confidence in drug discovery"
Watch how the seamless integration of cell-based assay technologies streamlines your workflows and simplifies your laboratory life. throughput, reliable results and fast discoveries. click on the following application notes. The failure of preclinical drug entities is a major problem for pharmaceutical companies, accounting for substantial proportions of their precious R&D budgets. As a consequence, there is a need to bring compound toxicity testing into a high throughput environment similar to primary efficacy screening. Metabolism of drugs is a key factor in compound toxicity, and the cytochrome P450 (CYP) superfamily of enzymes – mainly expressed in the hepatocyte cells of the liver – play a very important role in this process. There are now a number of screening assays designed to be automated in a microplate format for medium throughput profiling of compounds which may induce or inhibit CYP activity. In this application note, we describe a 384-well microplate format lead generation method using three different CYP enzymes, illustrating a typical assay run in an ADME laboratory. 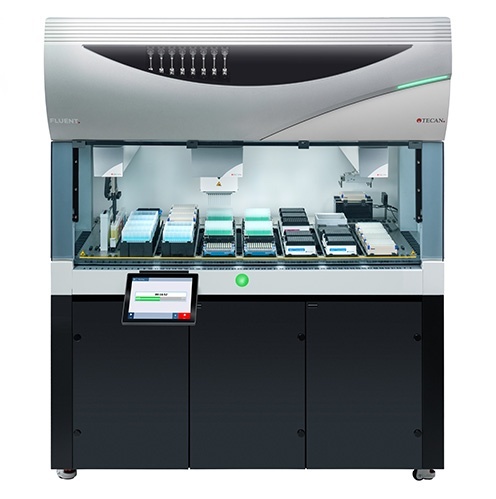 Fluent’s built-in touchscreen interface guides users through every task, making even the most sophisticated cell-based assays easy to run—ensuring fast, consistent, efficient operation. Fluent’s outstanding deck capacity minimizes plate transfers and reduces the time cells are outside of the incubator. Below-deck arm access offers expanded functionality and device integration without extending the instrument footprint. Fluent’s three, task-specific robotic arms work in parallel for faster processing, and offer automated lid handling to maintain sterility and minimize evaporation. Fluent’s seamless integration with cell biology devices allows you to run every step of your workflow on a single instrument. From incubation to analysis, everything you need to store, transfer, manipulate and measure cellular samples has been brought together in a single, automated solution. "Working in 384-well microplates, we're currently handling 40 plates in a single run. This would take at least five times as long to do manually, so the benefits are felt immediately." Tecan offers a broad portfolio of sterile consumables ideal for cell-based research. From disposable tips to troughs, every product undergoes stringent testing to ensure the precision, consistency and purity you need for reliable, reproducible assay results. Fluent integrates nicely with the Spark® multimode plate reader, a next generation detection platform delivering outstanding performance and throughput in all standard detection modes from Absorbance and Fluorescence to TR-FRET, FP and Alphascreen®. Integrated cell imaging and full environmental control, including a unique cooling module, even allow for live cell analysis. Tecan’s HydroSpeed™ plate washer features extra-gentle wash settings that you can adjust to suit specific cells, microplates and applications, enabling you to achieve reproducible results even with weakly adherent cells. A clean environment can be maintained inside Fluent with the integration of a HEPA hood, allowing cells to be kept under sterile conditions when needed. The touchscreen interface guides users through daily tasks. Optionally embed SOPs for every method for consistent operation. Programming and running even the most complex cell-based assays is quick and easy with FluentControl™ software. The Fluent Gx Assurance Package integrates user management and controls method permissions. Operators can even set personalized favorites on the touchscreen. FluentControl offers robust default liquid definitions and makes it easy to change parameters for any fluid. Industry-leading deck capacity minimizes plate transfers for optimum cell handling and protection. Below deck device integration. Keeps footprint small. Parallel arm movements maximize throughput and minimize the time cells are outside the incubator. Complete pipetting flexibility simplifies even complex custom protocols. Automatically switch between 96- and 384-channel pipetting during the course of a run. Patented Path Finder™ technology automatically programs the fastest, most efficient route for every arm movement. Barcode reading ensures efficient sample tracking and enhanced process security. Fast, efficient tip collection adds to the instrument’s unparalleled speed and precision. Designed to simplify compound management workflows, Tecan’s innovative Fluent platform brings enhanced speed and flexibility to plate formatting and copying. Throughput and accuracy are paramount. So we’ve engineered a compact automation solution with three arms that work in parallel across a Dynamic Deck featuring exceptional plate capacity. Discover an instrument that speaks the language of your laboratory by making compound management more simple, efficient… and fluent. "It’s basically tripled the speed of most of our protocols." Read more in "Darting from plate to plate"
For many years, small molecule drug discovery has relied on the evaluation of one compound against another compound. Measurement of the activity of a small molecule against a target must be standardized, and this is achieved by determining the IC50 or EC50 value (half maximal inhibitory/effective concentration respectively) using dose-response curves. To set up dose-response curves, compounds must be dissolved in a solvent to create solutions of varying concentrations, and DMSO has become the established solvent of choice. Today, chemists provide the biologists or compound management teams responsible for producing the dose-response curves with compound solutions prepared in DMSO. The workflow frequently begins with picking the key target compounds from a number of different microplates, generally referred to as hit-picking. These key compounds have often been selected based on single concentration data from a high throughput screening (HTS) campaign. To set up dose-response curves, compounds must be dissolved in a solvent to create solutions of varying concentrations, and DMSO has become the established solvent of choice. Today, chemists provide the biologists or compound management teams responsible for producing the dose-response curves with compound solutions prepared in DMSO. Outstanding deck capacity offers high-density plate and tip storage in a small footprint. Unique, interchangeable design allows the modular worktable to be easily configured and reconfigured for plate reformatting, hit picking, tube-to-plate transfers, plate stamping and more. Adjusts to 96, 384 and 1536 plate formats on the fly by swapping between 96- and 384-channel adapters. Makes it easy to optimize the performance of plate reformatting, stamping and diluting. Washable fixed tips made of coated steel offer reliable septa piercing and expand the instrument’s wide dynamic range down to below 0.5µl. The Flexible Channel Arm is also compatible with Tecan’s disposable tips to suit the requirements of different applications. Fixed tips can be primed for fast, automated compound dilutions or pre-filling of dilution plates. The steel tips can be washed from inside for ultimate system cleanliness and more reliable results. Seamlessly integrates with a broad range of complementary peripherals including 2D and plate barcode readers, high-density plate and tip stackers, plate sealers, and random access carousels. Run every step of your workflow on a single instrument for greater ease, convenience and productivity. Smoothly and quickly delivers labware—including plates and tubes—to the instrument’s pipetting arms and integrated devices without interrupting the pipetting process. Provides fast lid removal and replacement to minimize evaporation for reliable, reproducible results. Built-in touchscreen interface guides users through daily tasks for fast, consistent, efficient operation. Optionally customizable to suit specific users or applications, the software makes it easier than ever to generate reliable results while increasing throughput and productivity. FluentControl™ software simplifies even the most challenging applications. Use drag & drop interfaces, 3D graphics, and single smart commands to distribute reagents or transfer samples. Create everything from pipetting steps to hit picking processes in an Excel or text file and then run them with FluentControl software. The Fluent Gx Assurance software integrates user management and control method permissions. Operators can even set personalized favorites on the touchscreen. Fluent’s finger exchange system automatically swaps labware fingers on the fly – move tubes to balance and then plates to a centrifuge or storage device. Even in the event of a power out or computer crash FluentControl reinstates the interrupted run and presents clear directions to the operator to restart thus saving time and reagents. Combine two flexible channel arms on one system for the ultimate flexibility and speed in hit picking or tube to plate transfers. Keep track of all labware and samples with several barcode reading options on the deck, on devices or using the Robotic Gripper Arm to carry the reader. Versatile Multiple Channel Arm tip arrays enable double serial dilutions for greater productivity. Flexible Channel Arm equipped with steel needles delivers fast, precise hit picking capabilities. Multiple Channel Arm compatible with 1536 well plates for added efficiency. Fluent’s leading-edge design delivers outstanding capacity and speed for genomic workflows. This innovative solution offers exceptional precision, high throughput and extended walkaway times, making it easy to get more done, more confidently. "The Fluent pipettes incredibly precisely – it’s wonderful ... This will be particularly useful for whole genome sequencing ... to achieve high quality libraries." Read more in "What is normal? Understanding the vaginal microbiome"
Fluent provides outstanding throughput and consistent results. Built-in touchscreen interface guides users through daily tasks for fast, consistent operation. Integrated user management, including method permissions, ensures secure protocols and optimizes selection for each user, are available as part of Fluent's Gx Assurance software. Three independent, task specific arms move in parallel to simultaneously and efficiently automate methods. Sample preparation, labware movement to peripheral devices and plate-to-plate or reagent additions can all occur in parallel — maximizing performance. By offering a choice of air and liquid displacement pipetting technologies, the Flexible Channel Arm provides unrivalled flexibilty to suit the needs of your laboratory workflow and increases productivity. Adaptive Signal Technology™, a new generation of liquid level sensing, enables the use of smaller sample volumes, minimizes the risk of errors and provides exceptional automated error handling. "I looked at a range of liquid handling platforms for the new facility, evaluating them for their speed, capacity and flexibility… the outstanding capabilities of the Fluent quickly became clear." Read more in "Taking a Fluent approach to genetic screening"
FluentControl™ software simplifies even the most challenging applications. Use drag and drop interfaces, 3D graphics and single Smart Commands to distribute reagents or transfer samples. Fluent Gx Assurance software offers integrated user management and controls method permissions. Operators even can organize personalized favorites on the desktop. Fluent’s Active Stop and Resume function enables the operator to instantly access the workdeck during a run — allowing set-up errors or omissions to be corrected — simply by opening the door. Dynamic Deck™ allows the worktable to be freely configured and easily be reconfigured. Parallel arm movements maximize throughput. Exchange Multiple Channel Arm adapter plates, even with tips mounted, for unrivaled speed and application flexibility. The Fluent® and Fluent Gx laboratory automation workstations are a powerful platform, yet FluentControl keeps it simple with TouchTools™, a dedicated operator interface on the touchscreen of the instrument itself. One great software, two powerful interfaces. FluentControl™ is designed to empower scientists to build, optimize, and maintain their own assays, without the need for computer programming expertise. By separating the interactions of everyday workflows from the configuration of new assays, Tecan has created ideal tools for both. Users can simply drag and drop commands to create a protocol, and use the 3D editor to configure their worktable elements and labware. A built-in auto-context check reviews the scripts as you create them – offering help if something might not work – and you can even preview your finished protocol in a 3D simulator, without wasting valuable reagents. "The future demands flexibility and the ability to quickly adapt to embrace new opportunities – we can’t simply go out and buy a new instrument for every new assay that we need to run." TouchTools – designed for every lab, every day. Activities such as running assays and daily maintenance become as straightforward as using the smartphone in your pocket. Users intuitively know what to do next, without the need for additional explanations. Touch-optimized interface for logging in, entering key values, reacting to user prompts, and more. And usability comes as standard – no extra programming is needed to make FluentControl user friendly. Customize your user interface with pictures, videos and instructions specific to your lab or protocols – embedding your SOPs in every run. This will reduce the training necessary for new operators, and delight laboratory veterans by making their day-to-day tasks easier than ever before. If your computer loses power in the middle of a method, TouchTools can guide the operator through recovering the run, showing what has already been done, what still needs to be done, and where everything should be. "(Fluent is) ... very quick and intuitive to use ... new operators find it incredibly easy to learn." Read more in "Faster food testing"
FluentControl is packed with features like Smart Commands, allowing you to program common tasks – such as distributing a reagent or transferring samples in replicate – with a single command. For more information while editing, press F1 to open FluentControl's integrated help system. If you make a mistake, go back. FluentControl automatically creates a backup of the database with each run, and offers an unlimited undo-redo list. If your method was running correctly yesterday but not today, FluentControl can simply restore it to yesterday’s operating state. Adaptive Signal Technology™ enables the instrument to reliably detect miniscule volumes. Combining hardware accuracy with exact labware definitions, FluentControl can precisely model the interior of wells, calculate the detected volume, and adapt the threshold to allow detection of volumes as small as 2 µl of water. Quickly and easily move data between FluentControl and external files using the ‘import/export variable’ commands. The worklisting feature even allows you to pipette directly from CSV files. FluentControl also offers easy programmatic integration, such as executing external applications or running customized VB.NET code. The built-in API also allows you to execute protocols on the instrument and start/stop runs from your own specialty software. "Everything we need is programmed into the user-friendly FluentControl interface." During a run, the liquid handling arms move with speed and grace, tracing the optimal paths around other modules. This is overseen in real time by Path Finder™, a patent-pending technology that evaluates where everything is in three dimensions, including the shapes of devices and the changing height of disposable tip stacks during a run. After Installation Qualification, default carriers and labware can immediately be used in methods. No additional teaching is required thanks to a combination of the hardware’s mechanical accuracy and precision and the software’s carefully refined definitions. Using Zero-G positioning, you can simply slide an arm to the desired location by hand, then click ‘transfer’ and FluentControl will know exactly where it is. Need to control that special device? FluentControl is ready for that too. Any SiLA-ready device can be controlled by default. Tecan has an extensive driver library available for other modules, too. Contact your local Tecan sales representative to learn more. Tecan’s Common Notification System (CNS) informs you on your mobile device when any user interactions are needed, or your instrument status has changed. CNS also offers connectivity with IFTTT allowing you to put the internet to work for you. ‘Snapshot’ gathers logs and system information when support is needed. ‘Remote Support’ allows you to connect with Tecan for troubleshooting. ‘Import/export method’ speeds up troubleshooting and allows easy transfer of methods between Fluent platforms. 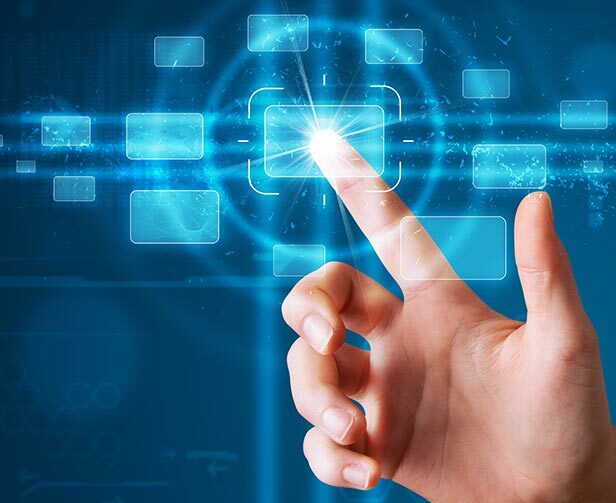 Multi-level user management allows bespoke control of access to protocols and software features. With three default user levels – operator, application specialist and administrator – plus the ability to define custom roles, this is ideal for busy, multi-user labs. User roles and passwords can be administered locally or from the windows active domain. FluentControl’s optional method approval feature delivers process security for regulated environments without compromising method development. This ensures that only approved and validated protocols are used for day-to-day activities, while providing application specialists with the ability to create and test new automation workflows. Traceability is crucial for regulated laboratories and clinical activities. FluentControl’s sample tracking add-on traces every sample, from initial identification using a handheld or integrated 1D/2D barcode scanner through to reporting of final results, including data from Magellan™ data reduction software. A detailed, secure and audit-ready log of all actions for each sample is generated, which can be automatically uploaded to your LIMS. FluentControl’s electronic records help laboratories to meet stringent regulatory standards for data security – such as those defined by FDA 21 CFR Part 11 – by providing protected copies of scripts, methods, carrier and labware definitions, liquid classes, and system configurations. Each file has a checksum to guarantee data integrity, and an optional electronic signatures function provides a detailed record of any changes made. For maximum process security, this feature can also be used to handle processing errors, requiring the user to approve any run that has been completed with errors or warnings. The Fluent Gx Assurance Software offers advanced features to streamline regulatory activities, helping laboratories to demonstrate compliance with minimal manual input. The Compliance Checker provides rapid, fully automated verification of the integrity of all executable software components – meeting the needs of GMP facilities and supplementing existing cybersecurity measures – while the Data Audit Tool performs a similar function for electronic records, ensuring data integrity. Histone acetylation and deacetylation play an important role in the regulation of gene expression. Histone deacetylases (HDACs) are a group of enzymes that remove acetyl groups from ε-N-acetyl lysine amino acids on histones, allowing them to wrap DNA more tightly. This condenses the DNA structure, preventing transcription. Conversely, acetylation neutralizes the positive charges on the histones by changing amines into amides, decreasing their ability to bind DNA. This decreased binding allows chromatin expansion, permitting genetic transcription to take place. 18 HDAC enzymes are currently known, which are either zinc-dependent or nicotinamide adenine dinucleotide-dependent (NAD-dependent). They are grouped into four classes according to their homology to yeast proteins. Classes I, II and IV are considered ‘classical’ HDACs, and are inhibited by trichostatin A (TSA). Due to the involvement of HDACs in various diseases and cancer development, there is now significant interest in selective HDAC inhibitors as potential therapeutic agents. The ability to carry out cell-based G-Protein coupled receptor (GPCR) assays in high throughput is a key part of the drug discovery process. Combining a Fluent laboratory automation solution configured for cell-based assays with the DiscoveRx PathHunter β-Arrestin human and ortholog GPCR assay kits gives users the power to run 384-well plate-based assays in high throughput. This increased processing speed and capacity over current solutions, combined with extremely efficient use of laboratory space, makes this a superior system for cell-based assays. The NCI-60 panel represents a wide diversity of common cancer-types and it is one of the most important tools in modern drug discovery for the identification of new anti-cancer compounds. Although, the cell lines are commonly used in phenotypic assays for monitoring cell growth and survival, when combined with bioinformatics tools such as the NCI COMPARE database, NCI panel data can also provide a preliminary indication of the potential mechanisms of action for novel compounds. Typically, large sets of compounds are initially tested at a single concentration. Hits showing growth inhibition or cytotoxic properties are profiled in dose response format over multiple cell lines to establish compound potency and selectivity. Epigenetics has played an important role in drug discovery for many years, but its importance has grown significantly recently due to the role epigenetic modifications can play in cancer and stem cell differentiation. Methylation is the principal epigenetic modification of DNA and of proteins known as histones, which package DNA into chromatin inside a cell. Epigenetic modifications define how genetic information is read and used by cells and, through cell divisions, these epigenetic changes may last for the duration of the cell's life. They may also last for multiple generations, even though they do not involve changes in the underlying DNA sequence of the organism. Epigenetic modifications can therefore be inherited, and are influenced by environmental factors, some of which can induce epigenetic signaling that may contribute to biological processes such as aging. The Cisbio EPIgeneous cell-based assays enable direct measurement of methylation, demethylation, and total proteins on both adherent and suspension cells. Tecan has re-invented automation with Fluent, a unique instrumentation concept built around the applicationspecific needs of your lab. Fluent breaks new ground, delivering more capacity and increased speed. Epigenetics has played an important role in drug discovery for many years, but its importance has grown significantly recently due to the role epigenetic modifications can play in cancer and stem cell differentiation. Methylation is the principal epigenetic modification of DNA and of proteins known as histones, which package DNA into chromatin inside a cell. Designed for those who ‘press go’, daily activities such as running assays and routine maintenance become as straightforward as using the smartphone in your pocket. Users intuitively know what to do next. Fluent was designed and built to increase throughput and productivity, enabling laboratories to get more done in less time – and less space. Tecan’s groundbreaking Fluent platform brings unsurpassed speed and flexibility to plate formatting and copying. Throughput and accuracy are everything, so we’ve engineered a compact automation solution with three arms that work in parallel across a Dynamic Deck™ offering unmatched plate capacity. Discover an instrument that speaks the language of your laboratory, making compound management more simple, efficient… and fluent. Seamless integration of cell-based assay technologies streamlines your workfl ows and simplifi es your laboratory life. Fluent’s groundbreaking design delivers more capacity and increased speed for genomic workflows. This innovative solution offers superior precision, higher throughput and longer walkaway times. Get more done in less time, with greater confidence. 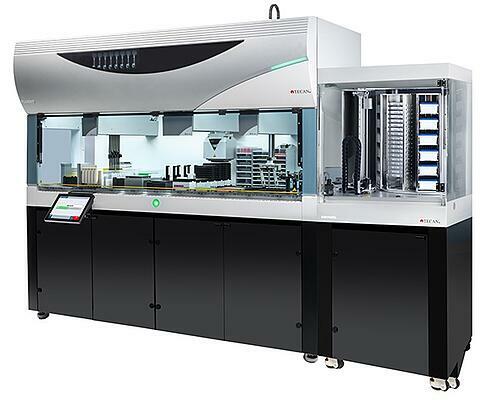 The MultiChannel Arm™ 384 has been designed to offer higher productivity to automated liquid handling workflows in pharmaceutical and biotechnology research applications, increasing the efficiency and speed of pipetting processes, as well as delivering an outstanding level of flexibility. Speed and throughput seem like logical reasons to acquire an automated liquid handling system but, for many users, the consistency of results is an even more valuable asset. An unobtrusive, barely noticed feature – liquid level detection – plays a critical role in ensuring the reliability and consistency of the pipetting processes, but not all liquid level sensing technologies are created equal. 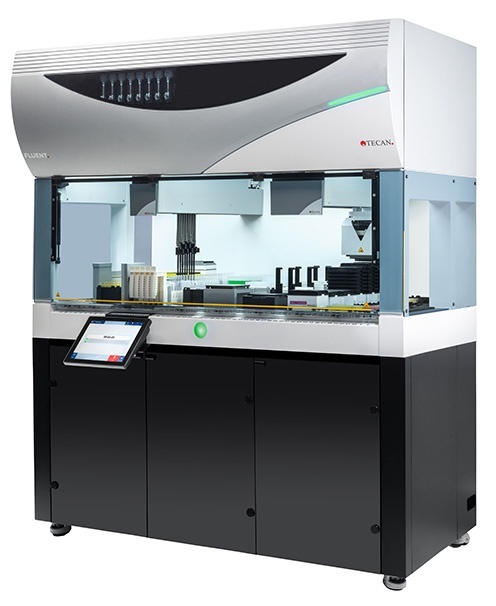 Tecan’s Adaptive Signal Technology is a new generation of capacitive liquid level sensing that does far more than just detect the liquid level in a microplate well; it can reliably distinguish between the true liquid level and bubbles, detect tip occlusions, prevent wells over-flowing, and offer new opportunities for in-process error handling. Dead volumes costing you too much. Reducing the liquid dead volume is a highly desirable aspect of a liquid handling platform’s performance, particularly in the case of expensive reagents or precious scarce samples. Minimizing the dead volume not only presents substantial reagent and sample cost savings, it can also result in more assays per unit volume, further decreasing labor costs and allowing more data per cycle. Fluent Laboratory Automation Solutions with Adaptive Signal Technology™ (AST) advanced liquid level detection offer several synergistic benefits that reduce dead volume without compromising on the precision or accuracy of liquid transfers. Read what Fluent users have to say. Read our Fluent-related blog articles.